◆The Geoparks Niigata International Forum Pre-event! 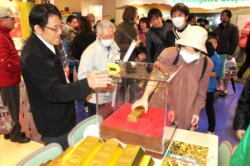 To promot the Geoparks Niigata International Forum, a pre-event was held at Itoigawa Station on Sunday, March 20 alongside the Hokuriku Shinkansen 1 Year Anniversary Event. Each geopark presented a number of activities for visitors. 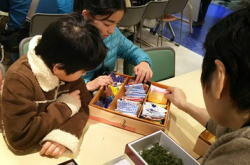 Sado Geopark brought a gold bar, Naeba Sanroku Geopark brought calabash gourd decorating tools and Itoigawa Geopark was represented by the Tokyo University Gardening Club which presented "Stone Bingo" and "Goepark Potpourri" activities! 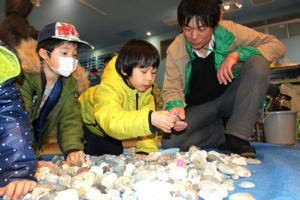 The pre-event was held in the GeoStation GeoPal Geopark Information Center located at Itoigawa Station's South Entrance and was attneded by over 6,500 people.